BENNINGTON, Neb. — Bill Janzen Jr. said his family returned to their burned-out Bennington home on Wednesday to see what was left. Firefighters battled a three-alarm blaze Tuesday night after they had been at the same home earlier in the day. The first time, crews extinguished a fire around the fireplace, then left when they thought it was under control. The state fire marshal is investigating the cause of the second fire, which left the house a complete loss. Janzen was there when the first fire broke out in his mother’s home. Firefighters cut into the home to expose the fire, then worked to put it out. The family watched the area for about 90 minutes, then gathered up all the valuables in the house and left. “We figured, boy, that was it. We averted a potential disaster,” Janzen said. 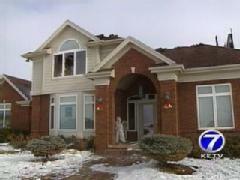 Just before midnight, the family got a call that the home had been destroyed by the second fire. Janzen said it was the home his parents, William and Doris, had built six years ago to someday retire in. After a battle with cancer, William Janzen died in his bed in the home last June. Bill Janzen Jr. said his parents shared and enjoyed the home, but they’re counting their blessings. “It’s just stuff. It can all be replaced. Family is far more important,” he said.